The Fête dela Musique Festival also known as the World Music Day, is an annual gathering every June around the world. Here in Manila, Philippines this will happen on the 21st which is just a few days ahead. 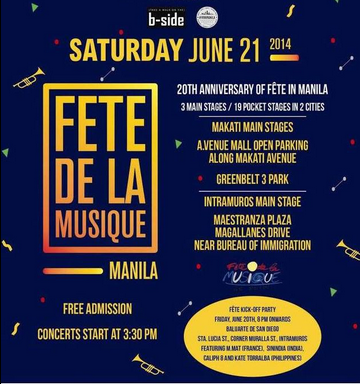 Featuring some of the country’s best musical talents, Fête dela Musique Philippines will be held at the A. Venue Mall Open Parking in Makati Main Stages, Greenbelt 3 Park, Intramuros Main Stage, Maestranza Plaza and Magallanes Drive near the Bureau of Immigration. That's over 10 hours of live music and over 200 acts at 3 main stages and 19 pocket stages in Manila and Makati for you... all for free. This is brought to us by the Alliance Francaise de Manille, the Embassy of France to the Philippines, the Department of Tourism, Intramuros Administration, B-Side Productions, Viva Manila, A. Venue Mall, the City of Makati. For more information you may click the official Facebook event page here. Coffee at work. How do we benefit from it?